Getting jobs done around the house takes tools and sometimes it takes specialty tools. If you’re looking for something high quality that can take care of your cutting needs then a reciprocating saw is the way to go. These saws can cut through just about anything and they make sure that the job is done right and quick too. But there are more saws than you might think. That’s why it’s important to look at each of the saws we have right here to decide which one is going to be best for you. That way you don’t have to go through the trouble of looking at everything out there to make a decision. Type: What type of saw is it? Does it have a cord or a battery? This is going to be personal preference, but a cord gives you continuous power while a battery gives you more freedom and versatility to get the job done. Variable Speed: Can you adjust the speed of the saw or do you only get a single speed? Variable speed is good for different types of materials or if you’re looking for a better quality saw. This is about your needs, however. Power: What voltage or how many amps does it take to run the saw? This will help you know what type of outlet the saw can be plugged into and how much power it takes to run it. Carrying Case: Does the saw come with a case to carry it around in? This is good even if you’re not planning to transport it because you get easier storage. Your saw will be protected even when you’re not using it. Weight: How much does the saw weigh? Keep in mind that even if you don’t transport it you have to hold it while using it. If it’s too heavy this can become difficult and you may not get the quality cut you want. Warranty: A warranty means that the company stands behind the product and that’s going to be important for anyone. You want a longer warranty that tells you the company believes the saw will last for a long time. There are plenty of different saws out there and making sure you have the best one is going to be difficult if you go at it alone. That’s why you want to make sure you can narrow things down. Luckily for you, we’ve narrowed it down already. We have 10 of the best options when it comes to reciprocating saws. That way you only have to look at a few before you make a decision. You’ll also be able to get to whatever that next project is that you want a whole lot faster this way. This reciprocating saw is going to give you everything you’re looking for, from a brand that’s well known for tools of high quality. 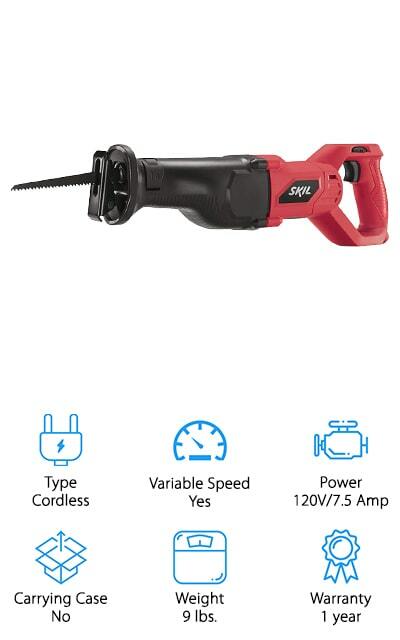 The variable speed means that you can get as much as 3,000 strokes per minute when you’re going through wood and you can get just the right amount of power overall as well. 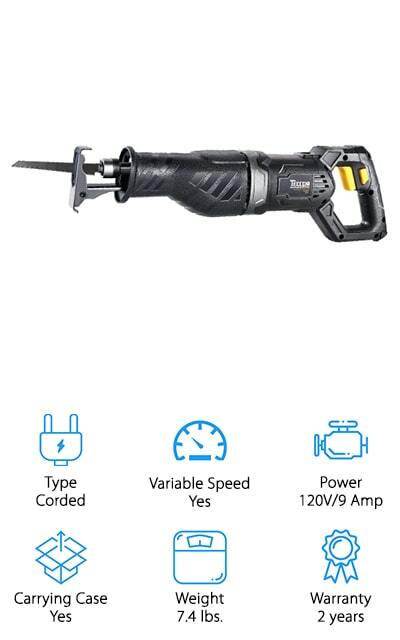 The 120-volt system provides you with quality and the fact that it uses quick lock technology means that you can remove the blades and switch them out without needing additional tools. This system has an internal counterweight that makes it more comfortable to hold and cuts down on the vibration that you may be getting with similar systems. Not only that but you’ll get a carrying case and a 5-year warranty. If you want the best reciprocating saw blades for wood but you don’t want to spend a whole lot, you’re going to want this one. It’s made by a company that’s well known for quality tools and provides you with the variable speed that you’re looking for. It’s a cordless system, which means you get more flexibility about where you want to use it, and you’ll be able to get plenty of time before it needs to be charged again. The variable speed gives you just the right amount of power and the fact that it uses tool free blade changing makes it more convenient for you. You get a pivoting shoe, up to 20 volts of power and up to 7/8” of stroke length. All of this means that you’re getting a saw that you can count on to get the job done easily. You’re also going to get a 2-year warranty on quality and durability. This may be a small reciprocating saw, but it’s still going to get the job done. It’s lightweight, which makes it convenient to take with you or use for a range of different jobs. It also has a 120-volt power system and 20 amps of power. You’ll be able to get up to 2,900 strokes per minute of up to 1 1/8” in length. All of this depends on just how far you pull back the variable speed trigger and where you set the 4-position blade clamp to make sure you’re getting the cut you want. You’ll have a keyless lever action for the clamp and you’ll have a corded system that gives you continuous power so you can just keep right on working. Not only that but you get a 3-year warranty that says it’s going to last a long time. This might be the best reciprocating saw blade for metal because it provides you with the power that you’re looking for as well as the stroke length that you need. It can be easily changed to different blades and shoes without the need for tools and it has ball and needle bearings that help it to last even longer. The moderate weight makes it easy to carry and the fact that it comes with its own case makes the entire process even easier for you. There’s a 1-year warranty included with the saw, which lets you know that you’re getting high quality and durability. It’s also a corded model, which means that you can use it for as long as you want without having to worry about the battery. This saw gives you more than just the reciprocating saw that you’re looking for, it’s actually also a jigsaw, so you get even more versatility and a whole lot of features to get the job done. You’ll be able to choose between variable speeds to cut through different materials and maintain the control you need. On top of that, you get easy blade changes and a built-in blower that helps you to maintain a cleaner work environment. 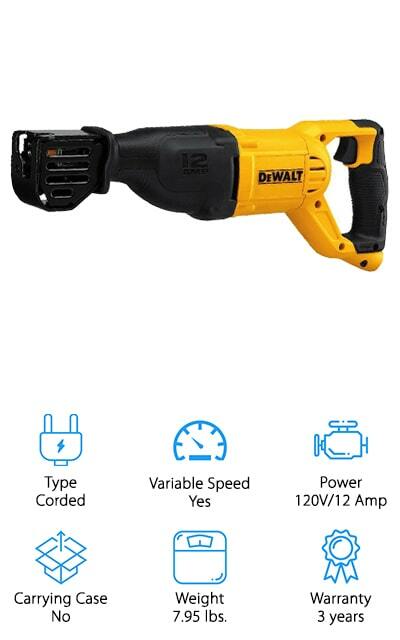 The battery is a standard 20V that’s easily interchangeable with different systems and one is included right here with the saw itself. The moderate weight is easy to carry and to transport wherever you want to go. Get ¾” stroke length and fast speed to make sure the job is done with the right level of control. This no-load option is great for just about any project you have. 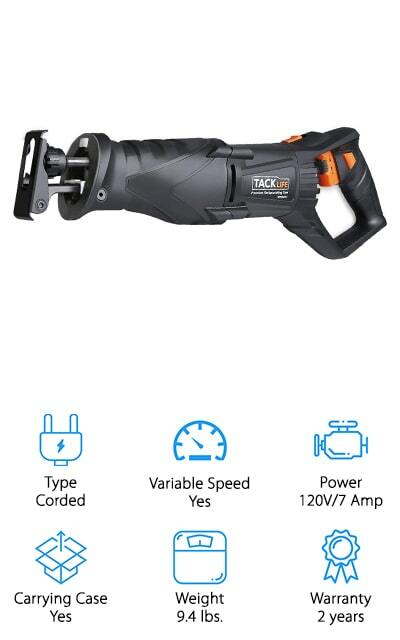 This isn’t one of the best reciprocating saw corded, it’s actually cordless and it’s also a great jigsaw because it’ s a 2 in 1. You’re going to get a moderate weight for the system, which is even more important when you’re getting something with more versatility. The saw itself can work with any reciprocating saw blade or any t-shank jigsaw blade, so you can get the compatibility that you need in order to a job done the right way. Included in the system is a built-in blower that makes sure you don’t get dust and debris in the way when you’re trying to cut. It also runs 120 volts and 7.5 amps, which means you can just keep going from one task to the next. This reciprocating saw offers just the right amount of power and provides you with variable speed options to make sure you’re ready for anything you might need to do. You can get all the way up to 3,200 spins per minute with this lightweight unit and you’ll have excellent quality while you’re at it. The pivoting shoe is designed to make it easy for you to maneuver while you’re trying to cut different objects and the low vibration makes it even more comfortable for you, whatever you need to do. There’s a 3-year warranty included that lets you know this machine is built to last and even though it doesn’t have a case you are going to get something easily portable. Plus, you can easily cut through wood or metal. 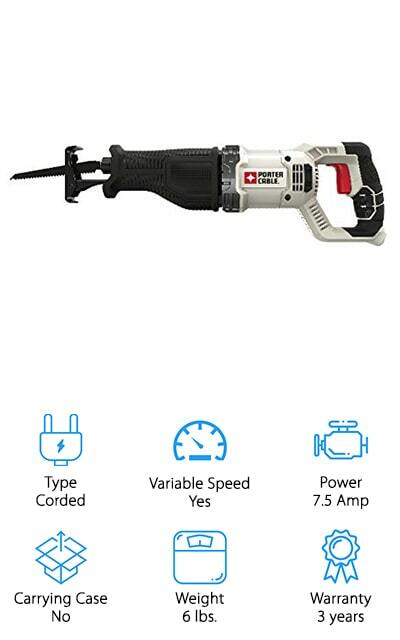 You’re getting some of the best reciprocating saw blades right here, with this cordless option. It gives you 2 separate blades to choose from and even provides a durable and sturdy grip that makes sure you can hold on no matter what. The handle even helps to absorb the shock and vibrations of the tool, making it more comfortable for you to use for extended periods of time. When it’s time to change out the blades you can do it easily without any tools and you don’t have to worry about power because you get variable speed. This unit is lightweight and even comes with a 3-year warranty that lets you know it’s durable and built to last. 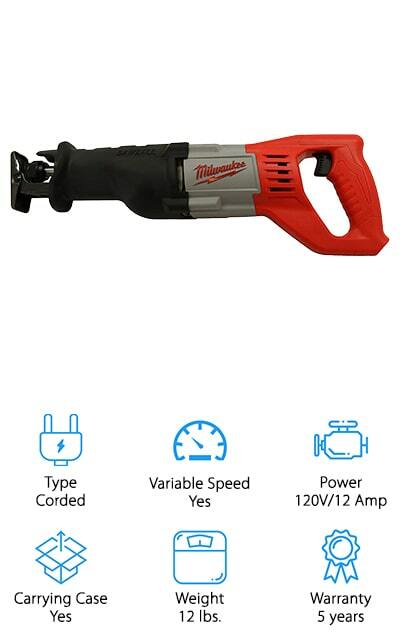 Get up to 3,100 strokes per minute and use it with older batteries from the same line to still get great quality. This system is going to give you plenty of pieces to get the next job done. It runs on 120 volts and 7 amps of power, which means you’re getting just the right amount running through all the time. You’re also getting a corded system with a 10-foot cable to give you flexibility and 2 saw blades that will help you get through anything. 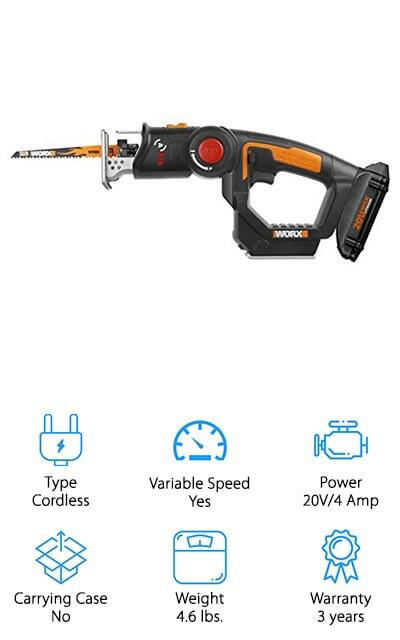 Even better, this saw even has a light attached that helps you to see exactly what you’re doing at all times and has a case to make keeping it all with you a whole lot easier. 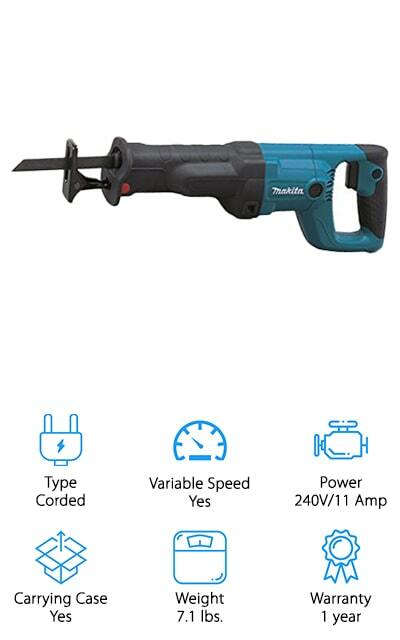 The variable speeds mean you can cut through just about anything and the blade change and shoe change process are super simple, without the need for additional tools. You also get vibration control so it’s easier and more comfortable to hold. 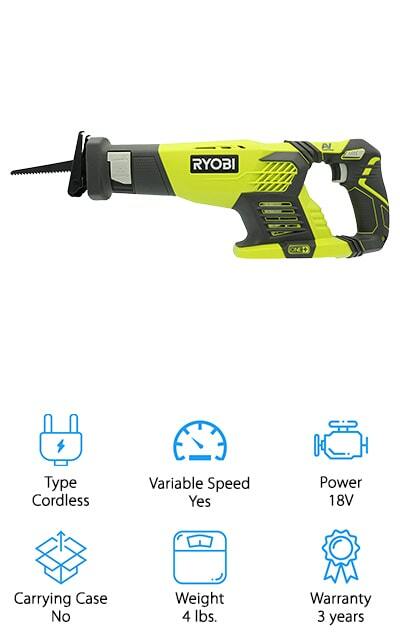 This isn’t the best cordless reciprocating saw but it might be the best corded one. 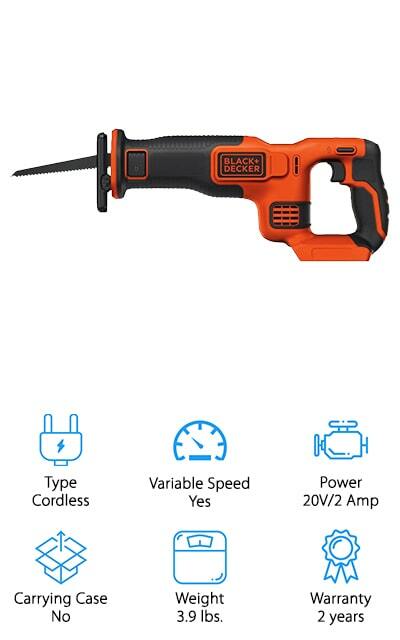 It gives you 3 different saw blades so you can cut through both wood and metal and it gives you variable speed through the trigger switch. You get the right stroke length and up to 2,500 strokes per minute, so it’s going to be moving just fast enough for anything you need. On top of that, you get adjustments for everything and you can make sure the 120-volt system is going to be working for you. With this set, you’re getting a 2-year warranty, which lets you know the system itself is going to be durable and it’s going to last a long time. You’re also getting a carrying case that makes it simple to take everything with you wherever you go.